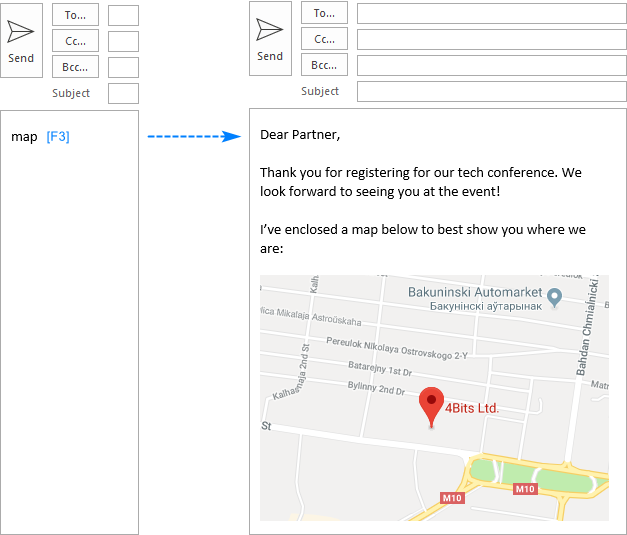 The tutorial shows how to create reusable pieces of content for Outlook emails by using Quick Parts, AutoText and Template Phrases. 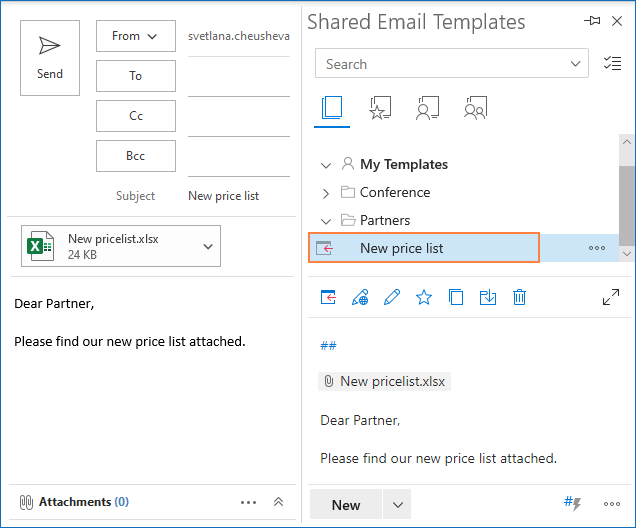 Like many Outlook users, you may often need to send the same text over and over again - new offers to your business partners, replies to prospective clients, reports to supervisors, and so on. Do you still do it the long and tedious keystroke way? In this case, you'll certainly find Quick Parts very useful. Not only will they save you a surprising amount of time, but also introduce consistency and accuracy in your emails. 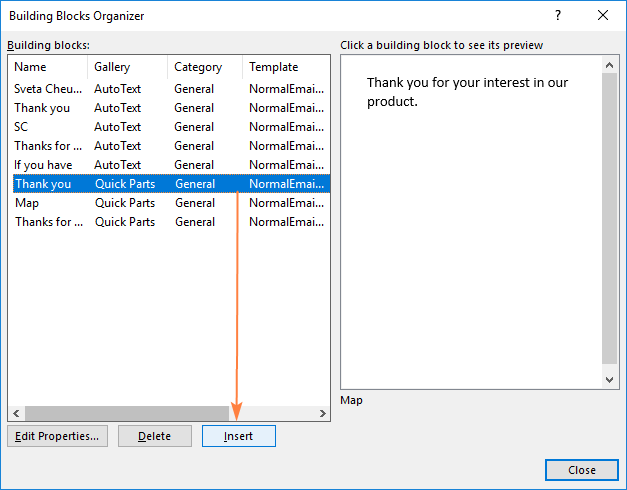 What is Outlook Quick Parts? Quick Parts is a gallery of reusable pieces of content that you can quickly insert into your email messages as well as appointments, meeting requests, contacts, and tasks. Microsoft defines this feature as "building blocks" for Outlook. Quick Parts were introduced in Outlook 2007 as a more versatile replacement for AutoText from previous versions. These snippets of predefined content are not limited to text only - they can include images, tables, graphics, and formatting. The Quick Parts feature works the same way in all versions of Outlook for Office 365, Outlook 2019, Outlook 2016, Outlook 2013, Outlook 2010 and Outlook 2007. To begin with, type the desired text, format it the way you want, and include graphics if needed. Technically, it does not matter where you create a new building block - the steps are the same for emails, appointments, contacts and tasks. Select the content that you want to store. In the dialog box that pops up, specify some attributes. For the most part, you'll only need to a give a unique name to your new building block and can leave the other fields in their default values, as shown in the screenshot below. When done, click OK to save the new entry. Once a Quick Part is created, you can access and reuse it at any time from everywhere including emails, meeting requests, tasks, etc. Name - type a unique name for your new Quick Part. Because a building block can be inserted by name, short and meaningful names can save you a lot of time. In the gallery, the names are listed in alphabetical order. So, if you want a specific entry to appear at the top of the list, you can prefix the name with a number or underscore, e.g. "1map" or "_map". Gallery - select the gallery in which you want the new building block to appear. 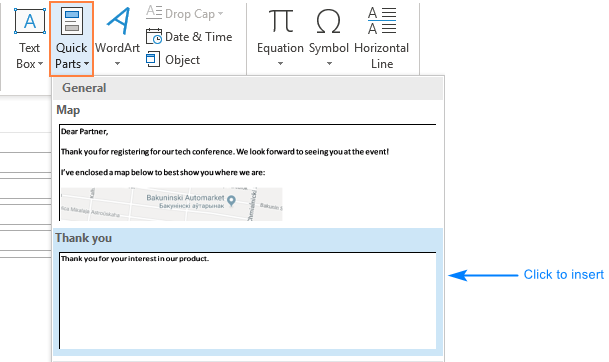 Outlook can save entries in many different galleries, but generally you'll use Quick Parts and AutoText. Category - categories belong to galleries and you can regard them as kind of sub-folders for further grouping. The default category is General. If you have over 10 reusable pieces, it's a good idea to organize them in your own categories. For this, click the drop-down arrow and choose Create New Category. Description - optionally, type some text that describes the entry. But you may not bother about this attribute, as you'll never see it or use it. 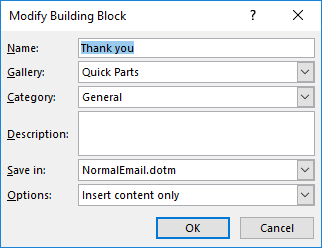 Save In - Save to the default NormalEmail.dotm template if you want the new Quick Part to be available in all emails and other Outlook items. 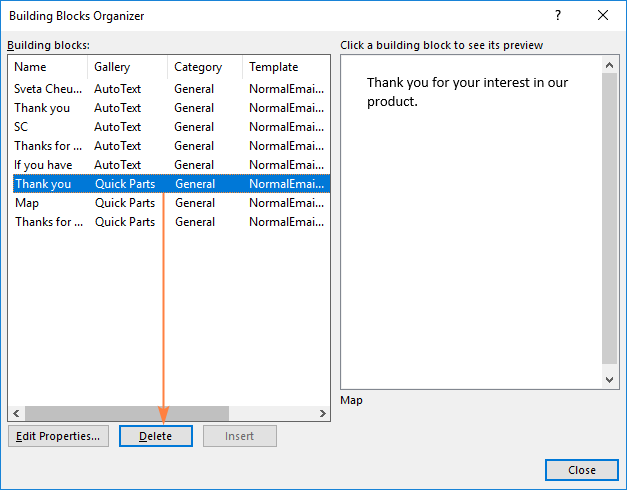 If you use your own Outlook templates, you can isolate your building blocks by template. A template must be open to appear in the drop-down list. Insert content only - the default option that you will use in most cases. Insert in its own paragraph - inserts the content into its own paragraph, even if the cursor is in the middle of another paragraph. Insert content in its own page- inserts the content into its own page; is more useful for Word Quick Parts. 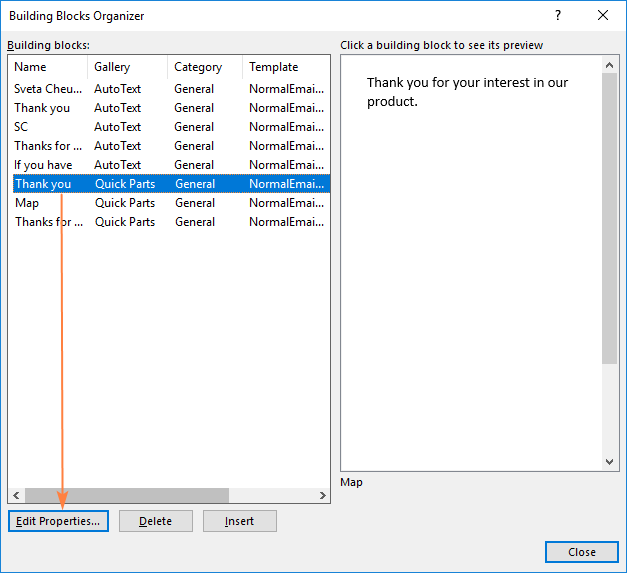 There are three ways to insert building blocks into Outlook items. The below instructions are for emails because we use them most often. The techniques for tasks, appointments, and contacts are exactly the same. In a message, type the quick part name where you want to content to appear. Press F3, and the name is immediately replaced with the full content. Done! In most cases, you do not need to enter the entire name. It is enough to type the part of the name until it becomes unique. To insert the entry named "Thanks for support", type "thanks" and press F3. 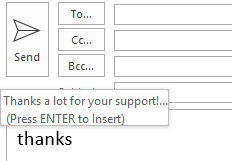 To insert the "Thank you" entry, you must at least type "thank" and a space character before pressing F3. 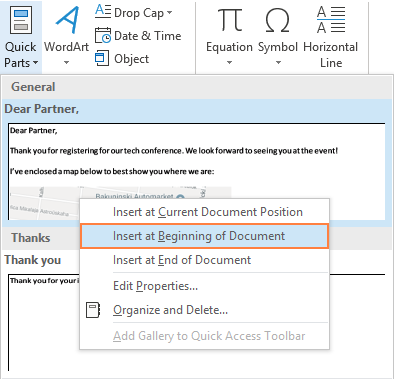 In Outlook 2016 and Outlook 2019, Quick Parts can also be auto-completed by hitting the Enter key. You just start typing the name and as soon as it becomes unique, the "Press ENTER to Insert" suggestion appears. Press the Enter key and the content is inserted straight away. Auto-completing does not work for pieces that contain images or other graphics. Auto-completing is not available in Outlook 2013, 2010 and 2007. In these versions, press F3 to quickly insert Quick Parts by their name. In a message, position the cursor where you want to insert the Quick Part. Go to the Insert tab >Text group and click Quick Parts. If you don't see the building block in the gallery, right-click on any entry, and then click Organize and Delete. In the Building Blocks Organizer, select the needed piece and click Insert. In the Modify Building Block dialog box, type a new name in the corresponding box and, optionally, choose another gallery, category and template. When done, click OK. When asked if you want to redefine the building block entry, click Yes. Right-click anywhere in the gallery pane and choose Organize and Delete from the context menu. Make the changes and click OK to save them. The Modify Building Block dialog box only allows renaming Quick Parts and changing their attributes, but not the content. Insert the building block into an email and make the changes you want. Save the modified building block with the same name. Note. To replace the original entry in the gallery, the new entry's name and all the attributes must be the same as the original. Right-click on any entry, and then click Organize and Delete. Select the entry you wish to remove and click the Delete button. When asked if you really want to delete the selected building block, click Yes. In Outlook 2003, AutoText was the only type of the available building blocks. 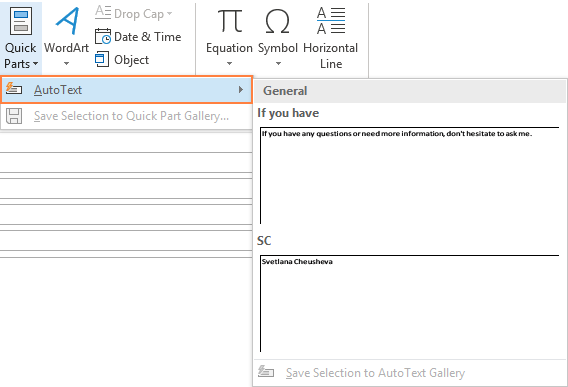 In Outlook 2007, Quick Parts appeared, and AutoText became its part. 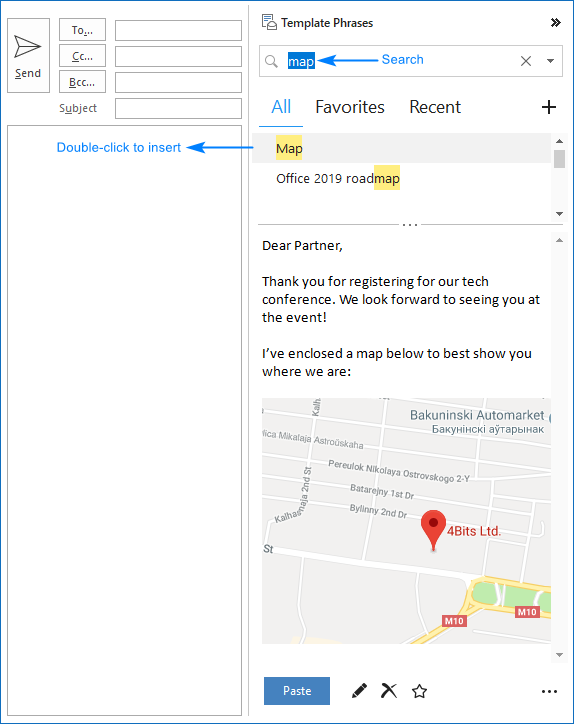 In the modern versions of Outlook, the only difference between Quick Parts and AutoText is that they are different galleries. In all other respects (creating, editing and inserting), they are absolutely the same. On the Insert tab, in the Text group click Quick Parts > AutoText > Save Selection to AutoText Gallery. Below I will share a few little secrets can make a great difference in the way you use Quick Parts in Outlook. That's it! The Quick Parts Gallery is now easily accessible from almost everywhere. Right-click the Quick Parts button, and then click Customize the Ribbon… . 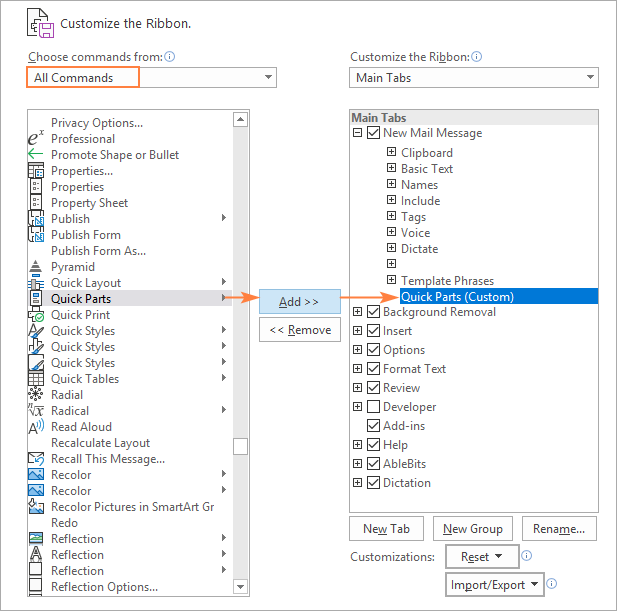 In the right part of the Outlook Options dialog box, under Customize the Ribbon, select the New Mail Message tab and click the New Group button. Click the Rename button and name the newly added group as you like, e.g. Quick Parts. In the Choose commands from drop-down list, select All commands, find Quick Parts in the list, and click Add. To back up your Quick Parts, close Outlook and copy this file to a save location. To restore Quick Parts, copy the file from your backup location to the Templates folder, with Outlook closed. Please note that aside from Quick Parts, the NormalEmail.dotm file also contains settings for all the styles that you have added or modified. So, when you back up and restore Quick Parts, your custom styles are also copied and restored. 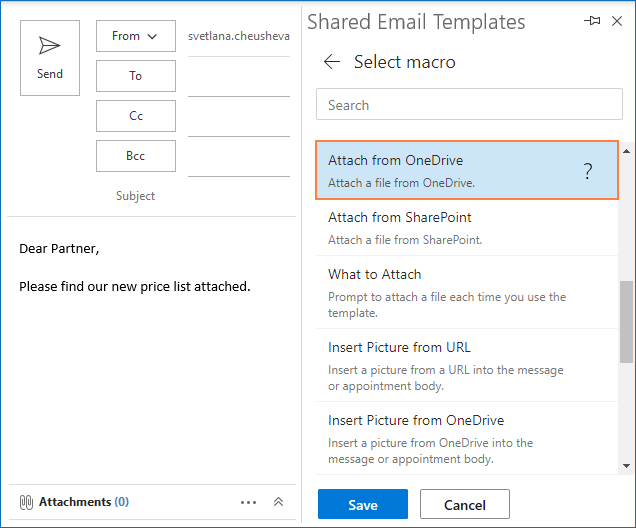 Create an Outlook template with attachments. Use Template Phrases to automatically attach files to new messages, replies and forwards. The Quick Parts and AutoText galleries surely beat manual copying and pasting. But I personally do not use them in my work. Why? Because I have even a better alternative - Template Phrases for Outlook. To get to Quick Parts it takes switching between tabs and navigating through menus. Template Phrases, comfortably residing on a special pane in the right-hand side of every message that you compose, are one click away. The Quick Parts gallery can become disorderly if you add too many pieces. An incremental search option of Template Phrases makes finding the right template super-easy. Quick Parts has no hierarchy. Template Phrases allows creating a tree-view with as many subfolder levels as you want. There is no easy way to share your Quick Parts or export your galleries to another PCs. With Template Phrases, this can be done in a button click. Previewing and editing the Quick Parts content is quite complicated and time-consuming. Template Phrases allows editing directly on the preview pane. It's not possible to add attachments to Quick Parts. With Template Phrases, you can attach files, fill in the Subject line, populate the To, Cc and Bcc fields, and a lot more! Select all the content that you want to include in a template. On the Template Phrases pane, select the folder where your new template should be stored, and click the Plus icon or press the Insert key. The New Template window shows up. You only need to give an appropriate name to your template (by default, that will be a few first words of the selected text) and may consider the work done. Optionally, you can automate a couple more things with macros and assign a shortcut that will insert your template into a message. In this example, we are going to add attachment and fill in the Subject line. For this, click the Insert macros button and select the corresponding macros from the list. As you hover over a macro, a hint will tell you what this particular macro does. The selected macros are added to the template automatically, without you having to do anything but browse for the files to be attached and type the Subject text. Additionally, if you plan to frequently use the template, you may want to insert it into a message with one of the predefined shortcuts (the currently assigned shortcut can be removed at any point later). Click the Save button, and the new template is added to your collection. 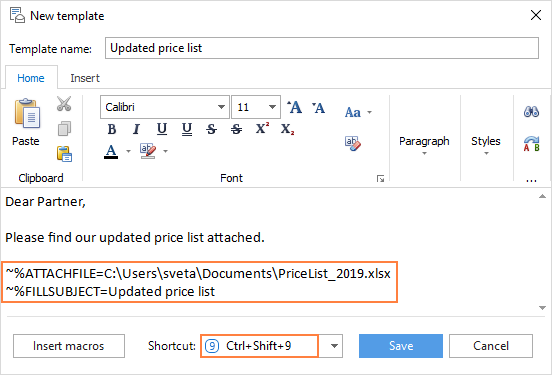 And now, whenever you want to send the updated price list to someone, create a new message and simply double click the template name or press the assigned shortcut (Ctrl + Shift + 9 in our case). Voilà, the message is ready to be sent - the text is inserted, the attachment is added, and the Subject line is filled, all with a mouse click! This is only a quick and short introduction to Template Phrases, but there is much more to it! If you are curious to know other features, you are welcome to download a trial. 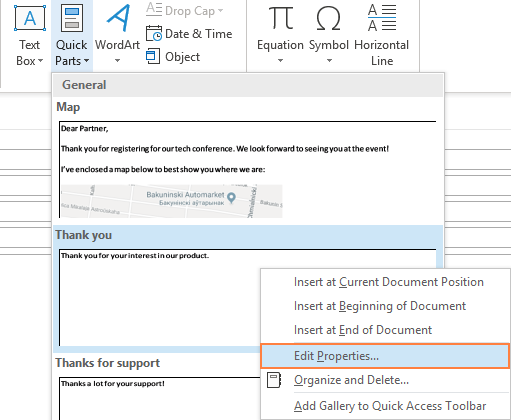 The Template Phrases tool is part of our Add-ins Collection for Outlook. The add-ins work with all versions of Microsoft Outlook 2019, 2016, 2013, 2010, and 2007. 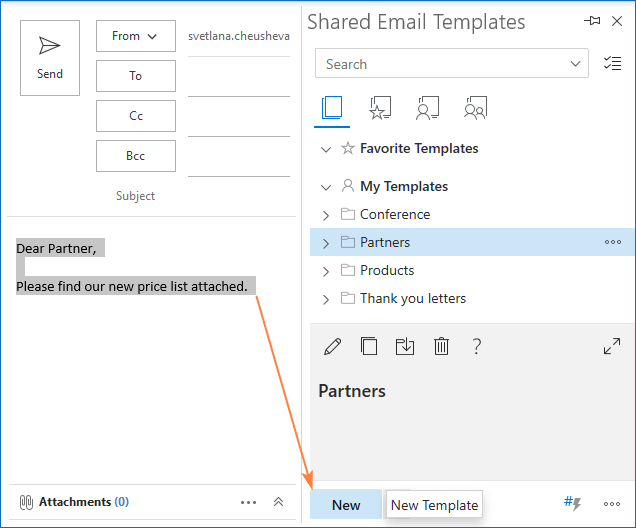 A free version of Template Phrases for Outlook Online is available. If you like our powerful mini-templates for Outlook emails, be sure to grab this coupon AB14-BlogSpo to get a license with the 15% discount. 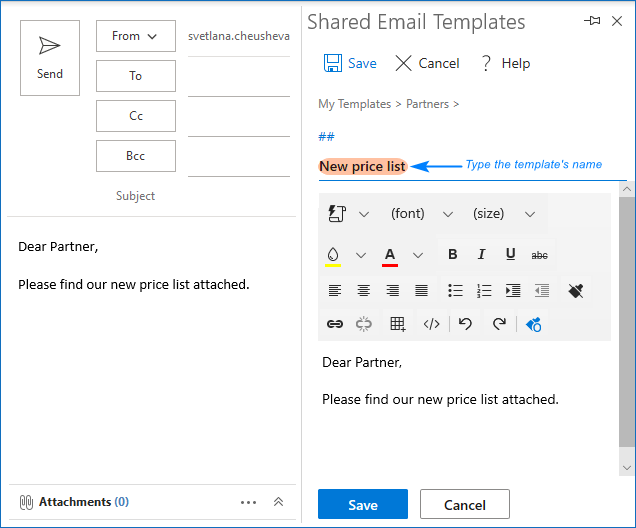 Outlook templates - troublesome and annoying to create, this may be the right way to go if you have to send hundreds of repetitive emails. 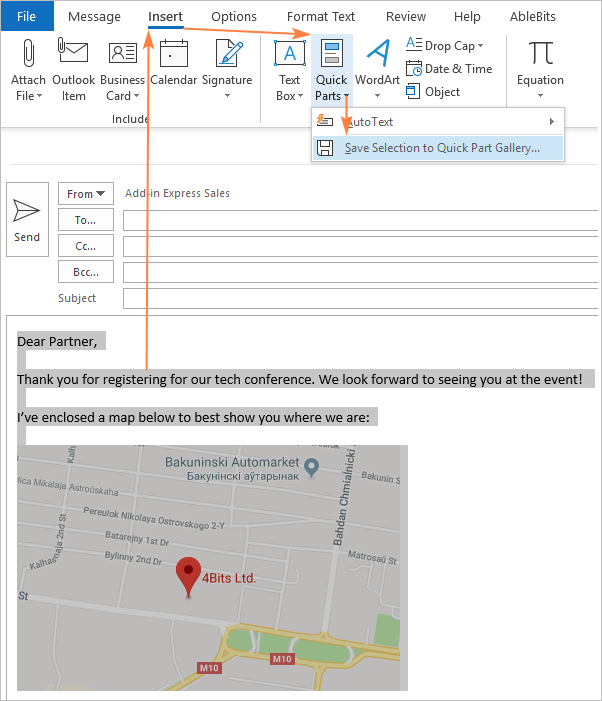 Outlook signatures - almost everyone uses email signatures, but nobody says they should be limited to standard information. Potentially, you can create multiple signatures as entire email templates.